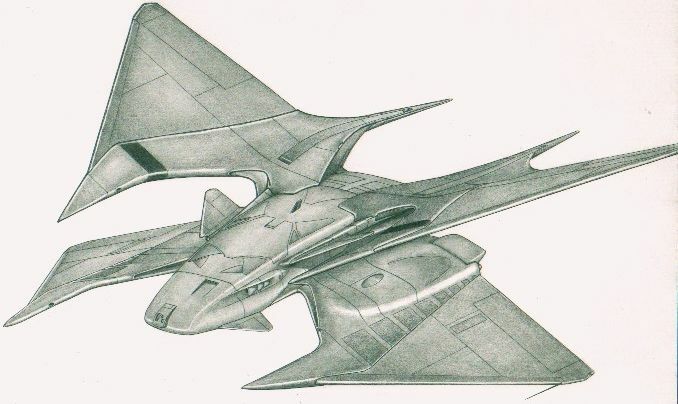 The Star Talon was the first trans-atmospheric starfighter built by any military prior to the coming of the Rifts. The fighter was built by Grumman Aerospace Engineering. The fighter design had only been put into service for only a period of three years before the coming of the Rifts and the vast devastation that resulted from the coming of the Rifts. There were some planet based units of this fighter and there was a full compliment of them on the space cruiser George Washington but other than those, there were no models of this fighter in orbit. There were five squadrons on Earth that had been in final preparations to be sent to Freedom Station at the time of the Rifts and two months from then, five squadrons were scheduled to be sent to the U.S. Moon colony interests. Unfortunately, all fighters on Rifts Earth are thought to have been destroyed. The Star Talon is design in a delta wing configuration but has four wings so the wings form a wide X when looked at from the front or the back of the fighter. The fighter also has four engines that are fairly widely spaced, This is so the fighter has a higher maneuverability in space. The fighter also has small maneuvering thrusters on all other sides. The fighter has four smaller canard wings just before the cockpit to increase atmospheric maneuverability. The fighters cockpit is in the traditional location of a standard fighter cockpit. The only problem with the physical design of the fighter is that the fighter has reduced stealth when compared to many fighters constructed at around the same time period. The fighter has four special hooks, They extend from the top and bottom of the fighter and are used to catch fighter on landing and used to hook fighter into a starships catapults for launching. Fighter is launched using catapults so that the fighter can quickly clear the landing path of other fighters and so the fighter’s engines will not do damage to the launching bay. The engines are the FT-1500 second generation fusion pulse engine that uses power from the fighters fusion reactor to use the fighters reaction mass to provide an incredible thrust to weight ratio. This engine is not equaled by any engine on Rifts earth or in the orbital community and can make a trip to Mars from Earth in 4 days using the fighters thrust. The engines are designed so the thrust of the engines can be vectored up to 25 degrees to allow the fighter to make both a short take off or landing while in an atmosphere. The fighter is well armed. In the front of the fighter under the cockpit are two ion cannons. This weapon is supplemented by the KEM-1000 Kinetic Energy Missile which while the payload is limited, the weapon has a longer range. Unlike many fighter built at te same time, the Star Talon's missile payload is not in internal bays. Instead the ordnance in carried on the fighters wing's and under the main body of the fighter. The fighter is not fitted to carry bombs. Because of the possibility of pilot ejection, the whole cockpit is designed to eject. The cockpit has a homing beacon and emergency radio that will last for one week. The fighters cockpit also has independent life support that will last for two days before being depleted. This starfighter follows theoretical information about starships operating non chemical propulsion in space. This has meant much greater speeds and accelerations. Listed is the formula to allow player and game masters to calculate the fighters velocity. Because the revised starship rules may not be desirable by all groups, vehicle statistics have been listed in standard Rifts levels as well. Using standard Rifts level, the aircraft performance is only a fraction of listed performances for the revised writeup. Destroying two wings on the same side of the fighter will cause the vehicle to crash from loss of control if it is flying within an atmosphere. If only one wing is destroyed, the fighter will be -2 to strike and -4 to dodge. Destruction of the fighters wings has no effect on the fighter in space but fighter will be unable to re-enter an atmosphere safely if both wings on a side are lost. Depleting the M.D.C. of the main body will shut the aircraft down completely, rendering it useless and causing the fighter to crash if in flight in an atmosphere. Flying; In atmosphere: The fighter can easily achieve escape velocity (Mach 32.6 / 25053 mph / 40320 kph) within 3 minute. The fighter has a maximum acceleration of 7 G. When the fighter is operating within an atmosphere, pilot will normally keep velocity below Mach 7.5 (5771.25 mph / 9288 kph). The fighter has enough thrust to be launched from a platform at a standstill position. The fighter is normally launched from a runway and requires only a short runway for take offs and landings because the fighters thruster are directional. The fighter will often use Ski-Jump style launchers for quicker takeoffs. If the fighter is over half loaded, The fighter can still leave the Earths atmosphere but must keep velocity below Mach 10 (7695 mph / 12,384 kph) to prevent stress damage to the fighter. Once fighter leaves the thickest portion of Earth's atmosphere, the fighter can accelerate at full to achieve escape velocity. Fully loaded, the fighter still has enough thrust to be launched from a standstill position and fighter can still use ski-jumps for take offs. When fighter is fully loaded, the fighter requires more runway distance to take off to prevent stress and cannot make short landing due to the extra weight.. Flying; Space: The fighter does not have an effective top speed but is limited by acceleration. Fighter can reach a top acceleration of 9 G but is limited by the fighters computer to 7 G to prevent pilot blackout. The fighter will often travel at an acceleration of 0.5 to 1 G for extended periods for patrol. Because the fighter is mostly unshielded from the effects of radiation and hypervelocity atomic particles, the fighter is not operated at speeds exceeding 20% of the speed of light. When the fighter is over half loaded, the fighters acceleration is limited to 5 G of acceleration. The fighter can be launched from a larger starship at great velocities but may not be able to decelerate to a direct stop before running out of fuel. Maximum Effective Range: Conditionally unlimited, while the fusion rector gives power for two decades of service, when the fighter is operating in space, it is limited by the fighters reaction mass. The reaction mass consists of mainly Deuterium (Hydrogen 2) and Helium 3. The fighter can be refueled at ground based facilities, space stations, and star ships as long as they have the special facilities. The ship can also be refueled by fuel shuttles. The fighter carries 4 days of reaction mass for travel at 0.5 G of acceleration. Double the consumption of fuel for 1.0 G of acceleration and double the consumption for every 1.0 G of acceleration beyond 1 G. this means the fighter will burn 128 times faster at 7 G than at 0.5 G. This allow the fighter about 45 minutes of fuel at 7 G. The fighter will often accelerate for a period of time and then shut down the engine and travel using the fighter velocity. If the fighter uses more than half of its reaction mass when accelerating, the fighter will be unable to decelerate fully and the fighter will normally only use a third or less of its fuel on accelerating so it does not run into a problem. If the fighter runs out of fuel then it must be recovered by another vehicle traveling faster or be lost.. The fighters engine acts like the conventional engines used on other nuclear powered aircraft while operating within an atmosphere except provides more thrust to the fighter than any engines presently on Rifts Earth and the engines do not use reaction mass while operating in an atmosphere. The fighter also carries supplies for pilot for a period of fourteen days and the life support will support pilot for up to two months before needing to be recharged. Cargo: Minimal (Storage for small equipment). Black Market Cost: If found it would probably be worth 125 million for a new, undamaged, and fully operation fighter complete with missiles and all weapons. The fighter would be worth about 150 million IOU in the orbital community. Ion Pulse Cannons (2): They are mounted on either side of the pilots cockpit and are forward firing but do have a 30 degree arc of fire. The weapons are powerful but have only average ranges. The weapons are used for dogfighting, anti-missile defense, and strafing runs. This is the main weapon of the fighter. These weapons are similar to those carried on the New Navy Manta Ray multi-environment attack ship. KEM-1000 Kinetic Energy Missile: Mounted in the Nose of the Fighter. The weapon launchers a large rod of high tensile strength mega-damage material. The rod is initially driven by a magnetic accelerator and uses a rocket propellant to increase the speed to even greater speeds. This weapon reaches incredible speeds by this method. The missile travels at 6,500 mph (10,460 kph) faster than the fighter when it launches the projectile. These missiles can be used against unmoving targets beyond the weapons normal range when used in space but suffers the same penalties that normal missiles do. Mega Damage: 3D4x10+20 per missile / projectile. Body Hard Points: The fighter has hard points on the main body of the fighter. The hard points can be used for either missiles or a special reconnaissance pod with extended sensor abilities. The reconnaissance pod takes the place of all main body missiles. Missile Racks: The fighter has missile racks on the bottom of the fighter. These racks can carry any missile from short range missiles to long range missiles. Missile are assumed to accelerate at 2 times normal mach speed in Gs greater than the starships speed when used in space. Missiles can be launched at non moving targets beyond the powered range of the missiles to hit targets without the chance of the launching ship being hit by missiles itself but penalties exist when launching missiles beyond normal missile range. Missiles can be mixed and matched at the rate of four shot range missiles or two medium range missiles for one long range missile. Rate of Fire: Can fire missiles one at a time or in volleys of two (2), four (4), or eight (8) missiles. Reconnaissance Pod: The center hard point can carry a reconnaissance pod in place of all missiles. This Pod included a neutrino sensor, a enhanced quality radar, higher visual magnification, and high quality data recording system. Wing Missile Racks (4): The fighter can carry missile on two hard points on each of its wings. These racks can carry any missile from mini missiles to medium range missiles. Missile are assumed to accelerate at 2 times normal mach speed in Gs greater than the starships speed when used in space. Missiles can be launched at non moving targets beyond the powered range of the missiles to hit targets without the chance of the launching ship being hit by missiles itself but penalties exist when launching missiles beyond normal missile range. Missiles can be mixed and matched at the rate of four mini missiles or two short range missiles for one medium missile. Payload: 8 medium range missiles, 16 short range missile, or 32 mini missiles total. Rear Grapple: the fighter has a grapple that is used for docking with vehicles that do not have landing bays and to grab items. The Grapple is fired at a target and uses a claw to grab the target and the grapple has a breaking strain of 100 tons. The fighter has all the standard features of a standard fighter plus these special features listed. Heat Shielding: The fighters hull is made out of heat shielding ceramic materials. The shielding causes plasma weaponry to do half damage to the fighter. Radar: Range of 500 miles (805 km) in an atmosphere and 50,000 miles (80,500 km) in space., the system can identify and track up to 96 targets simultaneously, It is also capable of Terrain Following for low altitude flight. The fighter can fire missiles at up to twenty four targets at the same time using this system. V. A. S.: Visual magnification that multiplies all images by about 1000 times which allows visual identification and tracking of fighter sized objects out to 80 to 100 miles. E.S.M. : Radar Detector, Passively detects other radars being operated.. COMBAT BONUSES: The SF-70 Star Talon is very maneuverable and very accurate. Use the Phase World Starfighter combat (Elite or Basic) skill. These bonuses are in addition to those from the piloting skill. Image drawn and copyrighted by Dany Boucher (korborak@istar.ca) . More Dany Boucher artwork at Fantasy Art of Elfwood.